During RIPE 63, a PGP Key-Signing Party will be held. We encourage you to come along if you’re interested in building your web of trust. Wednesday, 2 November 2011 at 15:30. 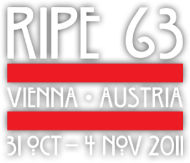 Meet at the RIPE 63 Registration Desk. Before the party, you’ll need to add your PGP public key to the party keyring. The deadline for adding an entry to the keyring is Wednesday, 2 November at 12:00. At the party, you’ll be provided with a printed copy of the keyring. You’ll need to verify that your public key is listed correctly on it. Each person present will read out the fingerprint of their own public keys for everyone else to verify. Please bring an independent copy of your key fingerprint (eg. your business card) to read from. As each fingerprint is read out, you can mark your copy with a check mark. Next, each person will confirm their identity by showing a legal document (such as a passport or a driver’s license) to the other participants. After you’re satisfied with the identity of a participant, you can mark your copy with a second check mark. At the end of the party, each participant will have a printed sheet on which they will have placed check marks to confirm public key fingerprints and identities. When you get home, you can download the keyring and sign each key that you have checked. After that, you should send each signed key to the owner of the key.